At Cantin Chevrolet, we have been committed to providing total customer satisfaction for three generations. For nearly 100 years, we have been treating our customers as guests, because they’re more than just numbers to us. For nearly a century, we have been going above and beyond for each and every customer that walks through our doors. That’s why so many New Hampshire drivers turn to us. After all, the dealership experience begins with the sale, but can extend for miles and years to come. Visit our Chevrolet dealership in Laconia, NH, for the outstanding new Chevy sales experience that you deserve. We look forward to serving you! Our honest, upfront approach to pricing makes shopping for a vehicle easy. We take the hassle and stress out of car-buying. By guaranteeing the lowest price on any new Chevrolet model, we eliminate painful negotiation and make looking for your next Chevy car, truck or SUV an enjoyable experience. Our incredible Chevy finance team works with you every step of the way to pair you with the perfect new or used Chevy that fits your specific needs on the road, and works with your unique budget. If you don’t see the exact vehicle you have in mind, we can use our resources to locate it for you, and get it on our lot, all at no additional charge to you. We will buy any car that we appraise, for the amount that we appraise it for. Our transparent and straightforward approach to sales even extends to when it's time for you to trade-in your vehicle. Regardless of make, mileage, condition, or whether you buy another vehicle from us or not, we treat you fairly and with honesty. You can always shop with confidence at our Lakes Region dealership. When Other Dealers Can’t…Cantin Can! 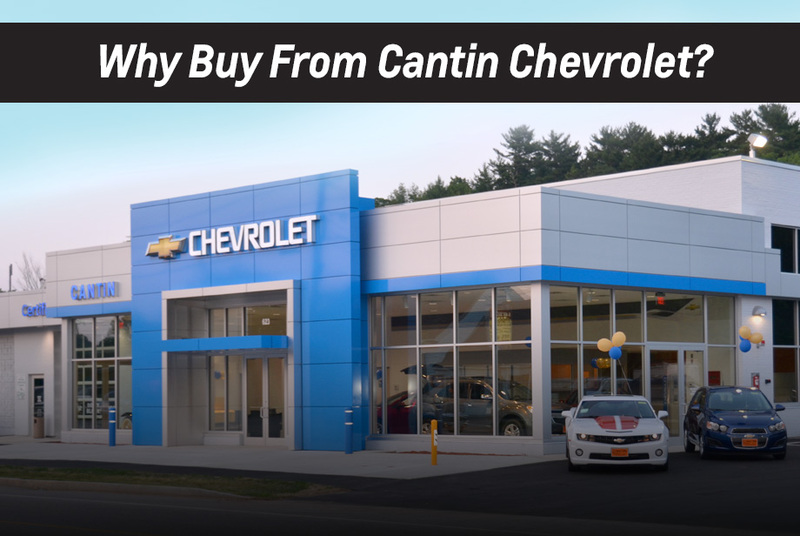 NEED ANOTHER GREAT REASON TO BUY FROM CANTIN CHEVROLET? If you don’t see the exact vehicle you are looking for, we can find it and get it on our lot. Normally, we can accomplish this within 48 hours and at no additional cost to you. Schedule a test-drive to conveniently come to you. We can come to your home or workplace with the vehicle you would like to try out. We offer two years/24,000 miles of complimentary scheduled maintenance on all new vehicles that includes two full oil and filter changes and four tire rotations.